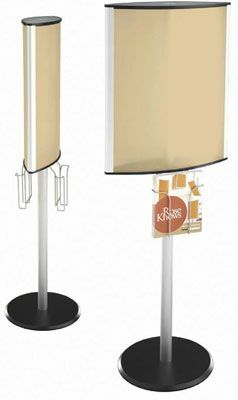 Rose Displays, Ltd. has introduced its elegant Contour Stand. The first product in the company's Contour Line, the Contour Stand creates a fresh look for graphics, providing a curved application front and back with an upscale, contemporary look. The stand, which accommodates 22-x28-inch poster-sized graphics, is double-sided, so that graphics can be viewed from any angle. As with all of Rose Displays' products, the stand is engineered for ease of use. Poster changes can be made without any disassembly, and putting the stand together at the store level is simple and quick, requiring just a hex key driver, which is included with the stand. With its sturdy construction, Contour Stand is ideal for high traffic areas. Two optional literature baskets hold 8.5-x11-inch printed materials such as brochures, catalogs, flyers, and promotional material, providing added versatility. Contour Stand is compatible with semirigid graphics such as poster board and styrene. For more information, contact Rose Displays at 800-631-9707 or visit the Web site at www.rosedisplays.com.